You can use the buttons on the toolbar of the image viewer window to rotate the image, switch to the full-screen mode, or, if you have several images in the same folder, you can view them as a slide show. 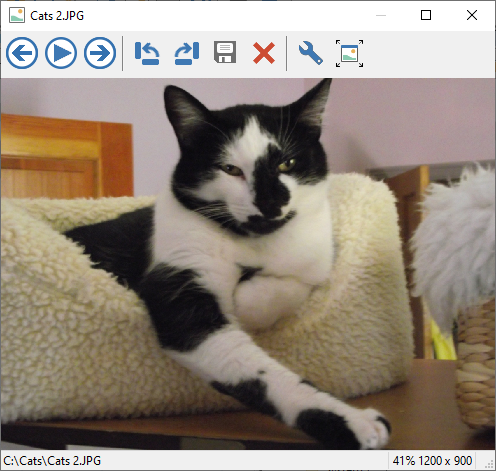 In addition to the internal image viewer, you can also set up an external image viewing application for a quick access from AB Commander to view the files that are not supported by the built-in image viewer of AB Commander. When you install AB Commander, the built-in quick viewer is set up as the preferred viewer, accessible via the Ctrl+I key combination, and the external viewer is set up as the alternative viewer, accessible by pressing the Ctrl+Shift+I keys. You can change this assignment using the Tools page of the Options window of AB Commander. You can also change the external viewer to another application, if desired.